Honeysuckle is a large, volubilate shrub of the genus Lonicera. There are over 300 species of honeysuckle in the Caprifoliaceae family, found from Asia to North America. The shrub reaches heights of 20–30 ft (6–9 m), with thin, hairy branches. It has ovoid leaves that range 1.2–3.2 in (3–8 cm) long by 0.6–1.6 in (1.5–4.0 cm) wide. The plant flowers in late spring or early summer, depending on the species. Japanese honeysuckle (Lonicera japonica) blooms in the spring from April to May, with fragrant white flowers touched with a shade of purple that fade to yellow as they mature. The species of honeysuckle that is found in North America, the United Kingdom, and western Asia, Lonicera caprifolium, flowers in June. Generally, honeysuckle flowers are 1.2–1.6 in (3–4) cm long, with an inner tube of approximately the same length. All varieties of honeysuckle are famous for this tube, which is extracted and sucked for its sweet nectar. The shrub also produces a black berry. Despite the sweetness of its fragrance and nectar, the medicinal parts of the plant are bitter, due to the saponin in its stem, the 8% tannin in the leaves and the 1% insitol in its flowers. Japanese honeysuckle (L. japonica, also called Japanese jin yin hua, which means gold and silver flower) and common honeysuckle (L. caprifolium, also called Italian honeysuckle, Dutch honeysuckle, and woodbine) are both widely used for their medicinal qualities. Although the Chinese most commonly use the bud of the flower in their medical practice, in other countries it is mostly the flowers and leaves that are used for their healing properties. Japanese honeysuckle works well as a detoxifier, and is best used for acute infections and inflammations. As an alterative, which cleanses and purifies the blood, and an antipyretic, which reduces fever with its cooling properties, Japanese honeysuckle is best used for such ailments as sore throats, swollen eyes, headaches, etc. Japanese honeysuckle is most useful in treating acute illnesses, infections and inflammations. At the onset of a cold, honeysuckle should be taken in combination with chrysanthemum flowers. Several popular Chinese formulas, such as yin chaio and ganmaoling, contain this herbal combination. Because it is a natural antibiotic, honeysuckle can also be used to treat infections caused by staphylococcal or streptococcal bacteria. Honeysuckle should be used for acute conditions, and is not meant to be used in the treatment of chronic illnesses. Honeysuckle works well against internal infections, and it can also be used externally for skin irritation and infections. 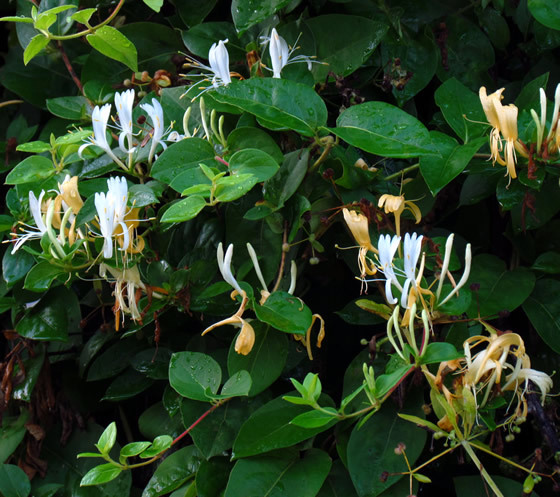 Honeysuckle has been found useful in alleviating rashes ranging from skin diseases to poison oak. For these types of skin ailments, honeysuckle is best used as a poultice. For cuts and abrasions that may become infected, a honeysuckle infusion can be applied externally. It is in treating skin infections that the stems of honeysuckle are used. John Gerard, a master herbalist of the sixteenth century, said that honeysuckle’s “floures, be steeped in oile, and set in the Sun, are good to annoint the body that is bennumed, and growne very cold.” Indeed, L. caprifolium as a fixed oil is good for the circulatory system. When it is heated and smoothed onto the skin, it has been shown to have a vasodilatory effect, causing the blood to flow into the dermis, which is the thick layer of skin beneath the epidermis. L. caprifolium can be used for asthma on account of its antispasmodic properties. An herbal infusion of the leaves is the best method for treating asthma. A decoction of honeysuckle flowers can be used for coughs. The seeds of L. caprifolium can be used as a diuretic. L. villosa, also known as American honeysuckle, has been used as a kidney stimulant. L. japonica has been used to treat dysentery, and diarrhea. Three teaspoons of the leaf infusion can be taken three times a day. For skin irritation, honeysuckle should be made into an infusion or poultice and applied externally to the skin. When honeysuckle is compounded in capsule form, 10–17 g can be taken daily. Although honeysuckle poultices are used for skin irritations, there have been cases of contact dermititis reported from pulling up Japanese honeysuckle. A patient that had come into contact with L. japonica reported developing a line of itchy blisters. People often taste honeysuckle tubes for their nectar; however, several cases of plant poisoning have been reported in children. The symptoms include gastrointestinal discomfort and muscle cramps. There are no known side effects from using honeysuckle. No known adverse drug interactions have been reported with honeysuckle.